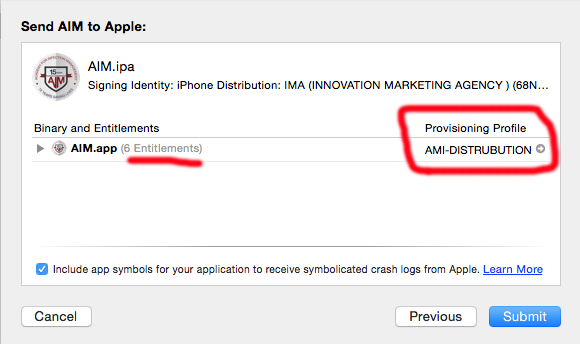 Missing Push Notification Entitlement - Your app appears to register with the Apple Push Notification service, but the app signature's entitlements do not include the "aps-environment" entitlement. If your app uses the Apple Push Notification service, make sure your App ID is enabled for Push Notification in the Provisioning Portal, and resubmit after signing your app with a Distribution provisioning profile that includes the "aps-environment" entitlement. I checked my ad-hoc provisiong and there I found aps-environment and production however, when I open up my distribution provisioning, I don't find such. Is this the cause of this error message and apple rejection, how can I fix it? Yes, that's the cause of the App Store rejection. If your ad-hoc provisioning profile has the aps-environment key, it means your app is configured correctly in the Apple Provisioning Portal. All you need to do is delete the App Store distribution profile on your local machine, then re-download and install the distribution profile from the Provisioning Portal. This new one should contain the aps-environment key. My blog post about this here. I got this message for a different reason -- I submitted an app via Xcode without first creating an App Store Distribution Profile specifically for the app. I believe Xcode automatically uses a wildcard App Store profile if you have one installed. But an app uses Push Notifications requires its own profile. The fix is to create a new App Store Distribution profile for the app. Then you download it, drag it onto Xcode, and modify your project Build Settings > Code Signing > Release to use the new profile. Following on from the answer given by @Vaiden, in Xcode 8 you can resolve this issue by selecting the target and clicking the "Fix issue". Of course, you'll still need to set up push notifications in the Apple Developer portal (you can simplify the process a little by using the new "Automatically manage signing" option, which saves you the hassle of downloading the provisioning profiles). 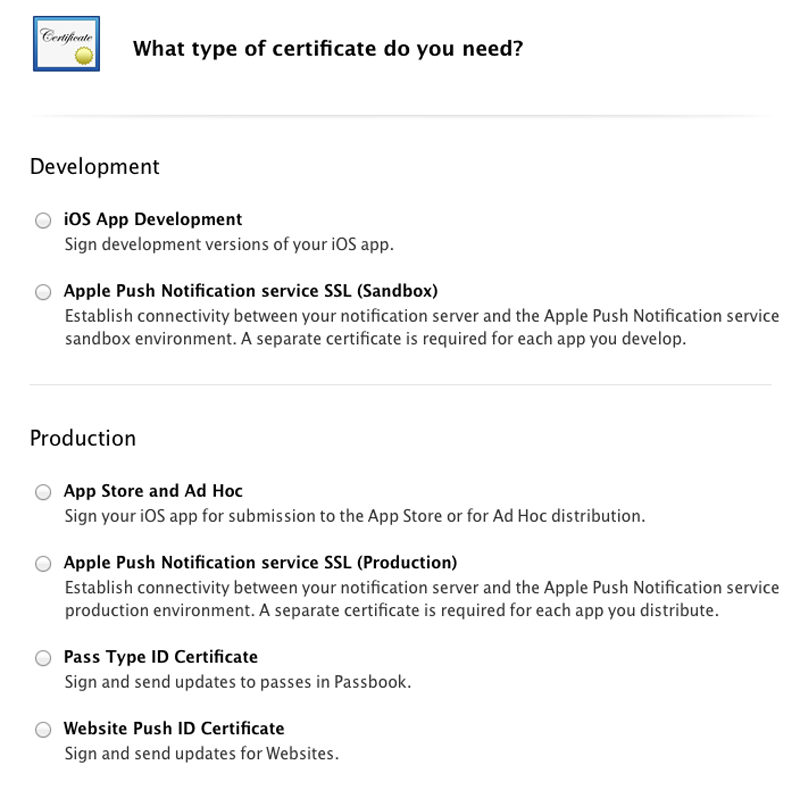 Our push certs were recently about to expire, so we created new dev / prod push certs in the standard way outlined by Apple (I won't go into detail around this here, there is plenty of info on it all over the web when updating your push certs for another year of use). After doing so however, the issue in this question popped up. No matter what we did, we received this email from Apple after submitting our app. When we checked the settings of our Distribution Provisioning Profile in the Apple Member Center, everything looked fine (Push was enabled for our App ID for both prod / dev, and our distribution provisioning profile was still connected to this App ID, we literally just created new push certs for another year as is the standard practice). In the entitlements file you made, right click in the empty file and select "Show Raw Keys/Values"
Add a new entry to the entitlements file called "aps-environment" and set it's value to "production"
One key note, if you were previously using the keychain-access-groups entitlement, you'll want to add that key here as well because for some reason it got cleared for me when doing this manually. Make sure the value is the same as the value used in previous builds (you can find the value by finding a previous build in Organizer, attempting to submit to the app store, select your team, then before submitting the app tap the arrow beside the "(X) Entitlements" string to expand the entitlements and see the value of the keychain-access-group entitlement. Archive your app and attempt to submit it to the point of getting to the final "Submit" button. You should see this app was now built with the new provisioning profile you created in member center. Cancel out of this now. Go back to the Apple member center and delete the new provisioning profile you created in step 1. Back in Xcode, refresh your provisioning profiles list once again by repeating step 2. Now archive your app again, and you should see that the app was built with the old Distribution provisioning profile you wanted to use, and correctly has the aps-environment entitlement. Submit and you're done. I know this isn't as detailed as it should be as it should have screenshots, I will try to update it with screenshots when I can but for the time being I'm in a time crunch right now and wanted to get the jist of what I did out there. There is also a very likely chance that some or most of the steps I've outlined aren't necessary, I'm putting them here because I did them and they may have led to the final solution. 1.Create fresh new certificate for Ad hoc & App Store only. 2.Then make distribution profile with this certificate and integrate profile with Xcode. Then newly submitted build with this profile approved without any warning. In my case, even I created a myapp.profile and set it in xcode manually, and when I chose "show in finder" and located the embedded.mobileprovision and checked to make sure aps-environment is there in the file, the error was still there. I then went to developer center and found that the status of XC: myapp.profile is invalid. I updated it and installed the XC: myapp.profile and it worked fine. I think xcode is trying to manage the profile and you need to check the provisioning profile when you submit your binary to store, and ensure it is the correct one. And according to other answers it can be caused for various reasons so it can be really annoying. Once you've signed with the downloaded profile and confirmed that aps-environment was there when you try to submit to App Store, you should be able to change the profile and code signing entity to automatic and iOS Developer. Hope it can be improved in Xcode 7. To solve this for an expo 'ejected' app, I went to the capabilities tab, enabled push, then disabled it again. This removed the APNS 'entitlements' setting from the .entitlements file. This happened to me suddenly because my app's distribution profile had expired. Xcode began using the wildcard profile instead, which did not have the push notification entitlement enabled. I didn't receive any warning. The fix was easy; I just had to generate another distribution profile for my app in the Apple Developer Member Center, download it, and double-click to install in Xcode. There are some really good suggestions on here. Referring to the last screenshot that Mina provided, after initially archiving my app, the provisioning profile mentioned during uploading contained a wildcard (XC.*). This is wrong. It took some considerable effort in order to resolve this. I had to perform a combination of the suggestions that Simon Woodside & Mina Fawzy provided. If you have any existing certificates and provisioning profiles related to your project, now would be a good time to remove them all locally, and revoke them all remotely. Give yourself a fresh start. Mina Fawzy's detailed suggestion is excellent. Performing Mina's suggestion, if performed correctly, should take care of you online. Review the Code Signing Identity and Provisioning Profile properties. Make sure you set those two properties to that of your project name. Don't allow XCode to automatically select for you, and don't use some generic code signing identity (e.g. Iphone Developer). Make sure you can actually install the app onto your devices before deciding to archive. The biggest problem that i have after enabling the Push Notification from Capabilities and remaking all the certificates is that the Target name and the folder name where was stored the project was composed from 2 strings separated by space. After removing the space all worked just fine! I had the same problem and my solution was to add the push notification entitlement from Target -> Capabilities. Not the answer you're looking for? Browse other questions tagged ios profile apple-push-notifications or ask your own question.